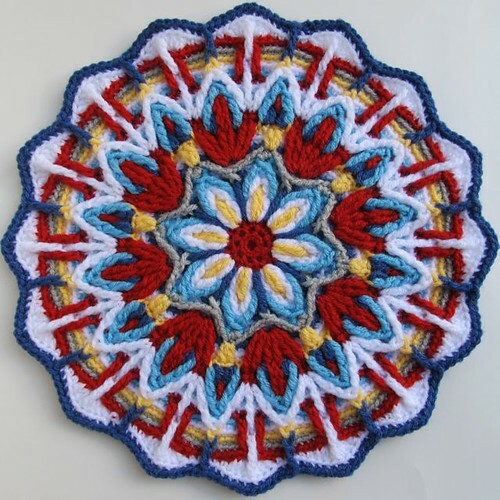 I finished my Crochet Overlay Mandala No. 1! It was such a fun pattern, and I can't say enough about how great a pattern it was! 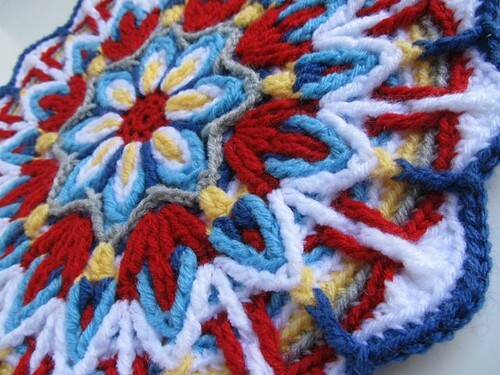 Being very well written, it's a fantastic way to learn this crochet technique. For yarn, I used Vanna's Choice (which is a worsted weight), and a 4.0 mm hook. At first I thought my hook size was too small because the mandala started to ripple a bit, but blocking took the ripple out. The finished sized turned out to be about 13 1/4 inches in diameter. I think I'm going to turn it into a wall hanging... maybe put it in a frame? And since I liked the pattern so much, I thought I'd make another out of cotton yarn. I think it could make a nice largish trivet for the table! For this one I'm using Loops & Thread cotton, which I'm finding very soft to work with, and a 4.0 mm hook again. I'm really liking these colors together. wink from a creative being who organized this lovely CAL, has set up a flickr pool for it if you want to check on everyone's progress. And you really should make one! The end result is really colourful and the 3-D effect so clever. 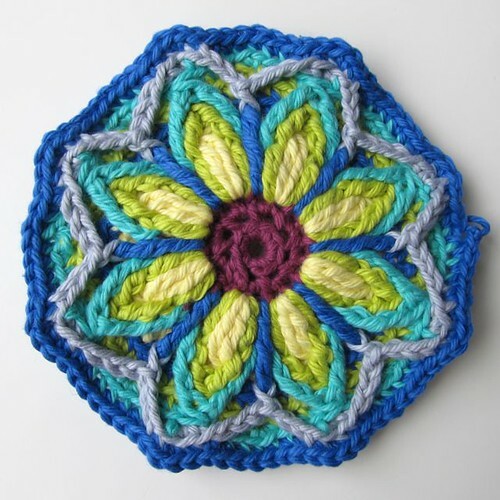 I love the colour choice and that second one, maybe for a trivet, is coming along nicely! wow! that's amazing! makes a gorgeous wall-hanging! So wonderful! Thanks for the blocking tip. This was very nice. Love it! 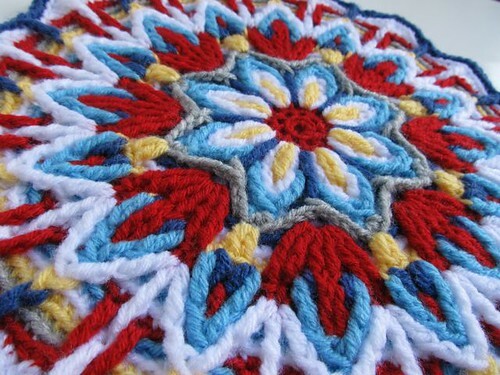 I like your overlay mandala, the colours are very striking :) I am going to turn mine into a small pillow cover when I am finished! Thank you! A pillow is a brilliant idea! I can't wait to see it! Love the pattern. The color combos are great. Hi ladies where can i actually find the patterns to make these .